Looking for the best meat thermometer? fits your needs and budget; cook with confidence! Do you want to be able to cook scrumptious recipes like the ones you see in cooking shows? But you're unsure whether you can safely cook meat to perfection? Worry no more because a meat thermometer is the answer to your problem. Using a meat thermometer makes cooking foolproof. It can help you check whether your meat is already done to your liking by determining the internal temperature of the meat. This saves you the task of cutting into the meat to check if the inside is already done. While using a meat thermometer, you can do other things while cooking because you don’t need to constantly watch the meat. Another motivation for getting meat cooked right is that undercooked meat can pose certain health risks, while overcooking simply takes the joy of eating a delicious meal, and eating burned meat too often might also be cancerous. Meat thermometers will help you avoid bacteria and diseases that grow on raw meat like salmonella and E. coli. Before moving on to our reviews of the best meat thermometers, here are a few features that you should consider when choosing the one that's right for your kitchen. This is important especially if you are constantly moving in and out of the kitchen. Doing a lot of things while cooking may make you forget that you left something to cook. So a loud alarm is suitable for you if you are constantly multi-tasking while cooking. This feature is necessary for those who forget to turn off the thermometer after using it. Forgetting to turn off the thermometer can cripple its battery life. This feature allows you to preset the meat temperature to your liking. Fire and forget! A programmable temperature lets you set the target temperature and monitor the meat. This is helpful whether you are cooking in low, high, or medium heat. This is one of the best features that a meat thermometer can have. When you are in a busy kitchen, being able to get the thermometer out of the meat to check the temperature is always an added bonus. If you already know how long you want the meat to cook for, having a timer is an added plus because it allows you to leave the meat to cook for when until it is ready, while you can do other things. The world's first rotating display pocket thermometer, the ThermoPop has a wide temperature measurement of -50 to 300°C makes it suitable for frozen foods and deep frying. The temperature can be displayed in both Fahrenheit and Celsius, and it weighs just 0.3 ounces. The ThermoPop is available in nine colors. It has an auto-off function that makes the thermometer turn off after 10 minutes. Its battery has a lifespan of about 5,000 hours and the package already includes CR2032 batteries. The ThermoPop is portable, reasonably priced and works well. It is designed to be convenient for both right-handed and left-handed people since the temperature can still be read even when upside down because of its rotate display function. It is also very convenient to use even in dark conditions because of its backlit display and large digits. The best part is that it is designed with molded-in seals and buttons, which make it splash-proof. This makes its durability longer than other thermometers of the same price range. The problem with the ThermoPop is that it is not very accurate for temperatures of over 250°C. It sometimes displays an error in temperature of around 1 to 2 degrees or worse. Although it claims to give instant results (in about 5 to 6 seconds), it sometimes takes longer. Lastly, it does not have an alarm for when it is done measuring the temperature. This may make it a deal-breaker for people who like to do other things while cooking. 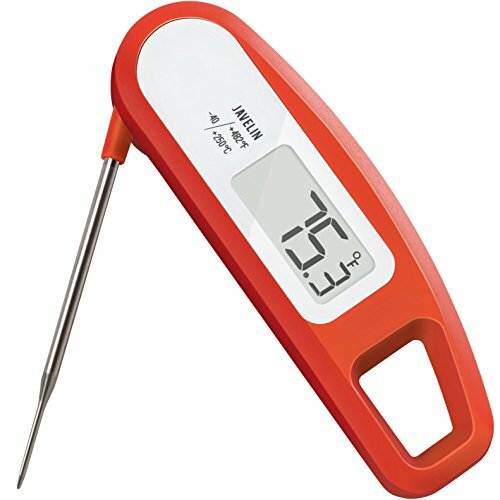 Even though it is designed for serious chefs and professionals, this thermometer is also convenient for first-time users because of its simple interface. It is the best find for a meat thermometer under $100. All in all, I rate this product 8/10. 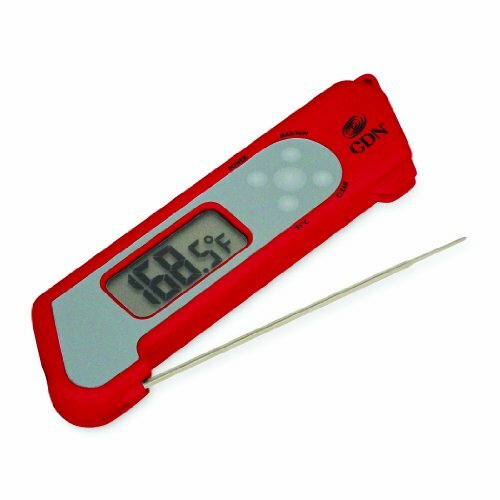 If you are still in doubt on whether to buy the ThermoWorks ThermoPop, another all-rounder option that you have is the CDN TCT572-W ProAccurate Digital Instant Read Folding Thermocouple Cooking Thermometer. It has almost exactly the same features as that of the ThermoPop but is cheaper. The CDN Thermometer is NSF-certified, which means that it is perfectly safe to use. It's water-resistant, shatterproof and its system can be calibrated. Aside from this, it also has a 5-year limited warranty. 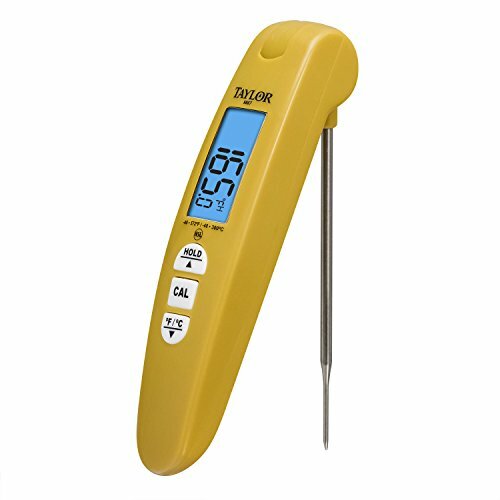 If you are looking for a meat thermometer that is ideal for professional use, then the Taylor Precision Products Digital Turbo Read Thermocouple Thermometer is your best option. The Taylor Precision thermometer can withstand temperatures ranging from -40 to 300°C (-40 to 572°F). It is built with a hold feature that allows you to remove the thermometer from the food to view the temperature. Moreover, it also guarantees a grade accuracy of +/- 2 degrees F. This thermometer is also designed with a folding probe, making the thermometer easy to store while also protecting its vital components. Each purchase of the Taylor 9867 thermometer includes an instruction manual and two AAA batteries. It also has a limited warranty of 1 year (excluding batteries). It is currently one of the most accurate meat thermometers available. Aside from that, it is also the most affordable probe thermometer you can find. It is really accurate in determining the temperature and it is also able to precisely determine abrupt changes in temperature (shifting from hot to cold) without lagging. Of the many ‘instant read’ thermometers that are available in the market, this comes close to being able to read as instantly as it promises. It also has a very thin tip of about 1.5 mm, which will not leave a noticeable puncture in the meat. The best feature of the Taylor 9867 thermometer is its hold feature that allows you to freeze temperature when the probe is removed. This makes it very convenient to read the temperature, especially in a busy kitchen setup where you are cooking a lot of dishes. Its calibrate function is also a plus, though you will rarely need to use it. All these benefits make it the top meat thermometer for professionals. Although it is deemed as one of the most accurate probe thermometers, the problem with the Taylor 9867 is that it is not water resistant. Aside from this, it is also not splash proof. It may not be a problem for some, but accidentally being exposed to water may break the thermometer. It is also not suitable to use in extreme moisture environments since moist builds up in the screen, making the temperature hard to read. Lastly, its sleek and very thin tip makes it hard for those who have big fingers or short nails to open the probe and makes it bothersome to use, especially if you are in a hurry. In weighing the pros as opposed to its cons, the Taylor 9867 is still a thermometer that is worth buying. It is the most affordable yet high-quality probe thermometer that you can ever find and it is portable and easy to store. Our team of experts rates this thermometer as 8.5/10 on the average. 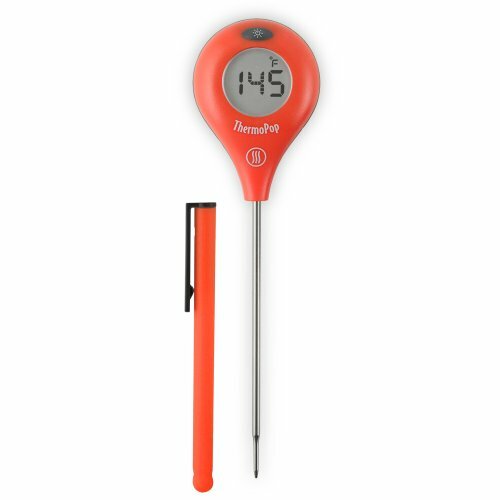 If you are looking for a meat thermometer that will fit into your tight budget, then the Lavatools PT12 Javelin Digital Instant Read Meat Thermometer is the one for you. It is very affordable yet also has a reliable quality. The Javelin thermometer determines temperature ranging from -20 to 150°C, given a +/- 0.5°C accuracy adjustment. Its temperature measurement can also be configured in Fahrenheit. It requires one CR2032 battery, which can last for about 4,000 hours. This thermometer is also NSF approved, making it confidently safe to use. Moreover, Lavatools offers a lifetime warranty for the Javelin thermometers. Dubbed as the best thermometer of its price-range, the Javelin offers both quality and budget-friendly benefits. Aside from being a meat thermometer, it is also suitable for liquids, candy and baked goods. Furthermore, this thermometer is magnetic, which makes it easy to store. Instead of putting it inside your kitchen drawers, you can simply stick it in your refrigerator or oven for easy access whenever you need it. The material of the Javelin Thermometer is made of high-quality impact-resistant polymers that make it indestructible from warping and cracking. Its 18/8 stainless tapered probe also makes punctures on your food unnoticeable. Its probe is also coated with anti-microbial silver-ion which prevents the growth of bacteria when using it on raw food. Aside from this, it also has a large and easy-to-read display screen and is also splash proof. The Javelin thermometer displays an inaccuracy level of more than +/- 0.5°C, which is opposed to what it claims. There are moments that it displays temperature at obviously inaccurate levels. Aside from this, after having used it for almost two years, the display starts to flicker and then permanently goes off. This is a negative since other thermometers can last up to 3 years or more without breaking down. In looking for the most suitable meat thermometer to use in your kitchen, you should always take into consideration the features of each brand, its accuracy and its quality. Of the reviewed meat thermometers above, all of them are guaranteed to have high quality. A few drawbacks can be expected since no product is perfect. You simply have to pick which drawback is something that you can live with. Of the different thermometers reviewed above, you should choose one that seems to be the most convenient for you, at the same time, having the features that you would expect to want in a meat thermometer.